While trade has been blossoming, lingering concerns over military technology and worries over an influx of Chinese workers could hurt ties. Vladivostok lies roughly 4,000 miles and seven hours ahead of Moscow – about the same distance and time difference between New York and Berlin. But while much of Moscow’s focus is on Europe and the United States – and on maintaining strong central control over Russia’s vast territory – the economic and strategic futures of Eastern Siberia and the Russian Far East are increasingly Asia-centric. The Russian Navy’s decision to station the two Mistral-class helicopter carriers it recently ordered with the Pacific Fleet, likely in late 2013, sends a powerful signal that decision makers in Moscow want to reaffirm the strategic importance of the region. And there’s one country that looms largest over the area, in demographic, economic and strategic terms – China. Why does this relationship, and this region, matter so much? There are several reasons, both local and global. For a start, if Russia feels like it is backstopped by a friendly but resource-hungry China, it’s likely to be a tougher to deal with on economic and security issues because the Kremlin will feel it has more leverage. Correspondingly, colder Sino-Russian ties could steer Moscow toward a more Atlanticist course and favour relations with Europe and the United States. Another point is that Moscow’s feelings toward Beijing will shape the Kremlin’s willingness to share military technologies with an increasingly modern Chinese defence industry. And, as Russian power wanes while China’s influence rises, there’s a genuine risk that nationalist political factions in Russia could react adversely to Eastern Siberia and the Russian Far East being drawn more closely into China’s orbit. Economic forces are currently driving regional ties, but larger scale Chinese immigration into Eastern Russia could revive Russian fears of a Chinese demographic conquest in the region. This issue is particularly sensitive as a sizeable portion of the lands north of the Amur River and the lands east of Jilin and Heilongjiang, which are now part of Russia, were considered Chinese territory for more than 150 years under the terms of the Treaty of Nerchinsk. Still, in purely economic terms, ties are close. 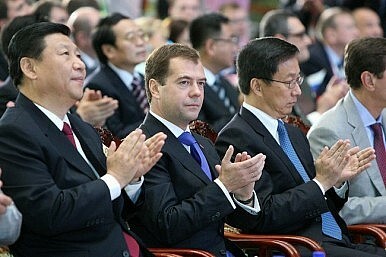 Trade between China and Russia doubled in 2010 to $60 billion, according to The Economic Times. As such, China-Russia trade has recovered basically back to levels prior to the global financial crisis, and could hit $70 billion in 2011. This would make Russia one of China’s 10 largest trading partners, with a significant amount of the value on the Russian side coming from Siberia and the Russian Far East. Much of the increase in bilateral trade ties has been based around natural resources, especially oil, metals, coal, and timber. And while arms sales have traditionally been significant, it increasingly appears that prospects for further large-scale Russian arms sales to China are dwindling as China’s indigenous arms production capabilities become more sophisticated and Russian unhappiness and distrust of China rises due to the reverse engineering of weapons systems such as the SU-27 (manufactured with upgraded components in China as the J-11) and the J-15 (drawing heavily on the SU-33 carrier-based fighter). Russia’s military sales to China now consist primarily of fulfilling the remaining portions of contracts signed in years past, as well as providing parts such as jet engines that China’s defence industry hasn’t quite mastered. The mixed picture in relations between China and Russia extends to key remaining trade areas, including Chinese exports of manufactured goods. It’s an aspect of the two countries’ economic ties that sometimes causes heartburn in Russia, especially when commentators point out that Russia sells raw materials, but China then sells such raw materials back in the form of higher-value added manufactured products. More positive for the two might be trade in natural resources. In the first six months of this year, Transneft moved an average of 300,000 bpd of crude oil to China through the East Siberia-to-Pacific Ocean (ESPO) pipeline. While it remains to be seen if Russia can produce the oil volumes it originally wanted to move through the two branches of the ESPO pipeline, recent reserve estimates suggest that Russia can support – and perhaps increase – exports to China for some time to come. Meanwhile, coal resources are also in play. In a September 2010 deal, for example, China agreed to loan Russia $6 billion to help develop coal resources and coal transport infrastructure in Eastern Siberia and the Russian Far East. As part of the agreement, China pledged to import at least 15 million tonnes per year of coal from Russia in the next five years and at least 20 million tonnes per year for 20 years after that. But while economic numbers are power, demographic numbers could be even more important in influencing ties. This is especially true in the case of Russia and China, where one country along their border has a surplus of open space, but a major population deficit relative to its neighbour. The Russian border areas of Siberia and the Russian Far East have a total population of 23.9 million, according to Rosstat. The Chinese provinces bordering Russia, on the other hand, have a combined populace of more than 111 million persons. While such a demographic disparity between neighbours doesn’t automatically translate into migration, the wealth of economic opportunities eastern Russia offers Chinese firms and entrepreneurs is simply too attractive to pass up. Credible sources such as scholars from the Russian Academy of Sciences estimated in 2009 that at the high end, there were as many as 500,000 Chinese migrants in Siberia and the Russian Far East. Given that most Chinese migrants work in the trading, agricultural, and construction sectors, it’s likely that the proportion of workers in Siberia and the Far East is rising, since these regions are hubs for such economic ventures. This point was underscored by a Russian Academy of Sciences report from 2009, which noted that Chinese have become the dominant migrant worker group in the Russian Far East, as well as the Siberian oblasts of Chita, Irkutsk, Novosibirsk, and Omsk. While China obtains an increasing amount of energy and other resources from Russia, these sectors are unlikely to become major drivers of Chinese migration into Russia. An increase in more labour intensive activities such as agriculture, however, would likely encourage substantial increases in the number of Chinese expats in Eastern Russia. The shift would likely be compounded by the fact that while street kiosk trading, logging, and construction are typically transient jobs, agricultural operations often generate steadier employment that could lead more Chinese migrants to consider settling more permanently in the region. The question, then, is whether increased trade and demographic links between China and Russia will translate into a stronger diplomatic partnership, or instead trigger friction that keeps the countries divided? Both countries are members of the Shanghai Cooperation Organization, the Six-Party Talks on North Korean nuclear weapons development, and hold substantial bi- and multi-lateral military exercises. At the same time, rising trade volumes can’t erase the reality that Russia exports low value-added raw materials to China and then imports higher value-added manufactured goods. Similar problems plague China’s economic ties with countries in Africa and Latin America, where the political tone in countries such as Argentina is becoming increasingly critical of trade with China. But it’s more than just about the dynamics between these two countries. In addition to rising distrust of China in Russia, the fact that China’s most important economic and security relationship is with the United States is likely to limit how deeply Beijing will engage Moscow. Just as commodities are fungible, for China, partnership with Moscow is ultimately replaceable at many levels. Engagement with the United States, in contrast, is critical and irreplaceable for China – and the United States as well. Gabe Collins is the co-founder of China SignPost and a former commodity investment analyst and research fellow in the US Naval War College's China Maritime Studies Institute. He can be reached at [email protected].